With summer approaching and family vacations on the horizon, it is a good time to start looking into purchasing a new tent for all your future family camping trips. However, you are interested in quality but do not want to spend an arm and a leg on a tent for the family. Rather, you are looking for a cheap and affordable option that will still provide your family with more than adequate shelter and a good place to sleep on all your camping trips. A lot of times when people hear the word “cheap” their mind immediately goes to low quality or inferior craftsmanship. This is not always the case. It is still possible to find affordably priced and large tents that are just as good as the others that have been hiked up in price. In this article, we will introduce you to a few of the best cheap family tent options that you will be sure to love for your next camping trip. First, you should decide what type of tent you will need and to do this, you will need to think about the type of camping you will be doing. Backpacking tents are lightweight tents, compact, and very portable options and are also the ideal choice if you are going to do some hiking and are traveling over long distances. This type of tent will usually only fit one to two people comfortably due to its size. Canopy tents are more a structure than a tent, and they provide a shelter that can easily be collapsed into a more portable and compact size. However, they are not a fully enclosed option, and they tend to be open on more than one side. 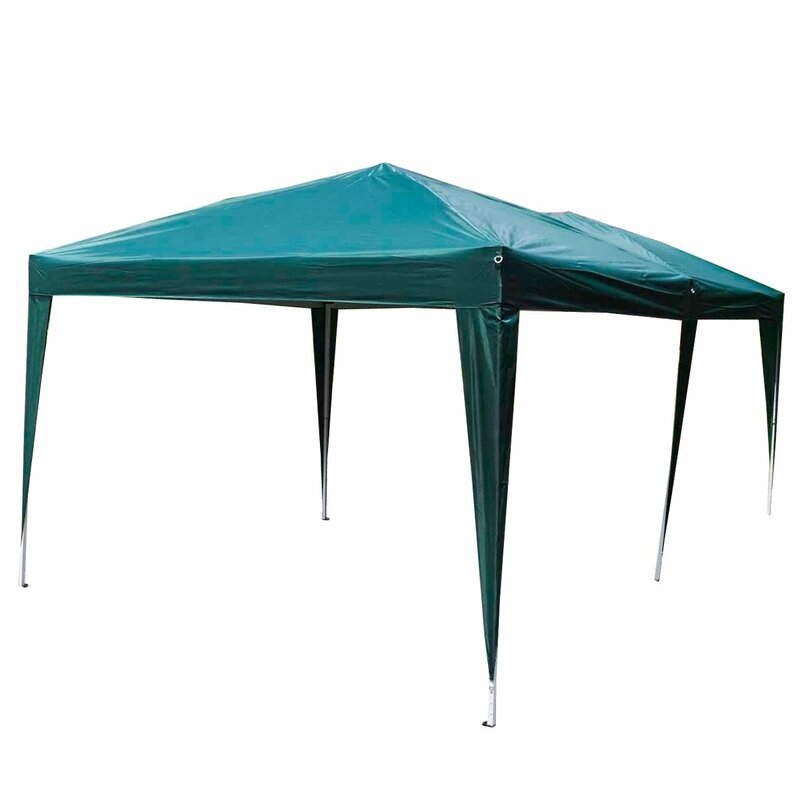 They can effectively protect you and your family from bad weather and they are great party tents. Family tents are much larger options and can fit anywhere from four to ten plus people in the tent at a given time. It is the perfect option if you plan on taking the entire family out; pets and camping gear included. The following will offer a bit more information on each of these tent types as well as a few viable suggestions for you to consider as you go through the buying process. Purpose: Camping tent for a group of 4 persons (adults, kids, pets) or more. I LOVE IT MOST! It’s always the best cheap camping tent ever (IMO). This tent is spacious enough for 4 or 5 campers. It measures 17 by 10 feet with a 72-inch center height, you can divide into three separate rooms. With only over 100$, you will have a great tent with Cool-Air port and Variflo adjustable venting system. In addition, you will only take 7-15 minutes to set up. A backpacking tent is a compact, lightweight shelter to help campers go hiking easily. There are some criteria you should pay attention to when choosing a backpacking tent. A lightweight and easy-to-setup tent is the top priority. You should buy a tent with suitable capacity, 2- or 4-people tent is recommended. In addition, a 3-season shelter with reasonable price will be better for you. Do not spend too much money on an expensive backpacking tent if you do not have much experience. 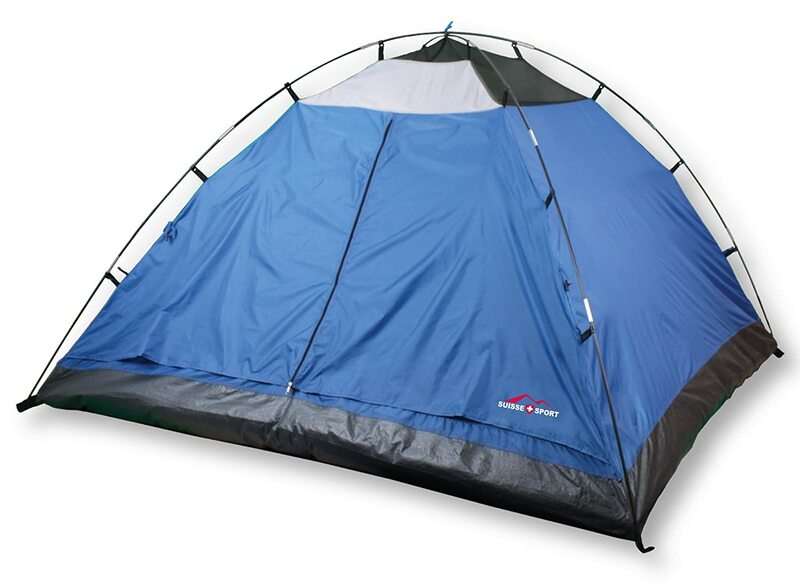 The Wenzel Ridgeline tent measures 7’x7’x50” feet and weighs 7 pounds, 4 ounces. This is a 3-dome tent ideal for hikers and cyclists. It has weather-resistant polyester fabric which keeps you safe from wet weather. With shock-corded fiberglass frame as well as two windows and roof vents for ventilation, you will find it easy to set up and comfortable to stay in. If you still hesitate, this tent’s rate at 4.3 out of 5 stars and over 130 reviews from Amazon customers will make you satisfied. Tents can be used for camping, outdoor gatherings, tailgating, and so much more. Depending on the activity you are participating in, you may find that you need a certain kind of tent or shelter. Backpacking tents are great for those longer trips in which you also plan on doing a bit of hiking and exploring. It is a lightweight shelter option that can be easily set up and taken down. 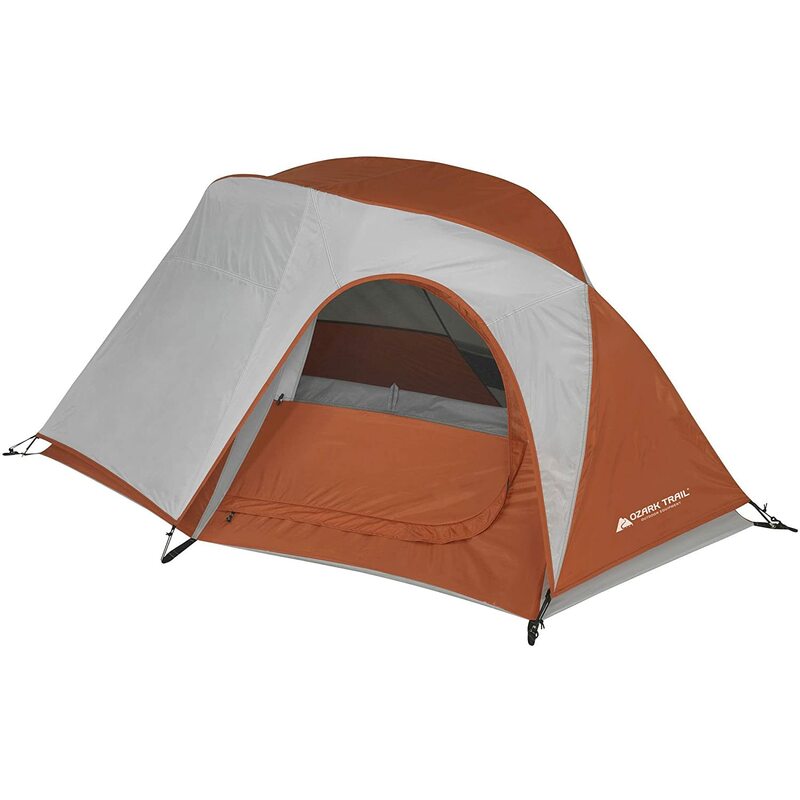 They are also very affordable depending on the size of the backpacking tent you choose. The cheaper backpacking tent options are suitable for a variety of activities including hiking, mountain climbing, exploring, and scouting; but a more affordable option may only fit yourself and your gear, so each member of the family may have to carry their own. If you are not so much planning on camping but are going to be hosting a large family gathering, then a canopy tent offers a convenient and shady locale for your outdoor celebrations. Canopy tents are often used for weddings, backyard barbecues, and even on camping trips and offer a nice and shady place to eat and hang out with family out of the sun and other elements. 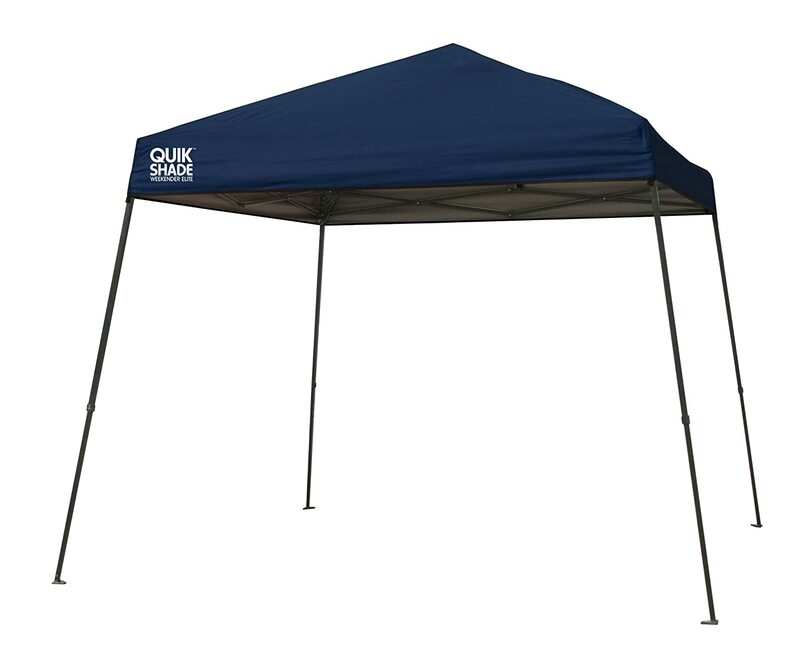 This Trademark Innovations Square Replacement Canopy Gazebo Top for 10′ Slant Leg Canopy measures 8’x8’ square and is made of 210D oxford coated waterproof material. This canopy replacement top fits Trademark Innovations 10′ canopy frames with slant support legs. With around $30, you can save money by purchasing a replacement top rather than a whole new canopy tent. If you are seeking a convenient tent for put on your minivan, this tent is for you. The Backroadz Truck Tent can be assembled in the back of your open-bed pickup, creating a comfortable, restful sleeping area for two people. It is quite an easy-to-setup with 4 shock-corded fiberglass poles. This tent provides the large interior with over 5.5′ of headroom and full rain fly to protect you against the wettest weather, you can sleep comfortably above the ground after a long journey. Choosing a good tent which can be used for such a long time and is worth your money is not easy. The Wind, rain, sun, snow can have a bad impact on your tent. Before purchasing a tent, you need to understand the different type of tents and their capacity. A three-season tent will be able to stand up to heavy rain and wind. This is the most popular choice for camping. Three-season tents are designed for conditions of spring, summer and fall. It can suffer downpours but not for harsh storms or snow. You can be safe from bugs when using this kind of tent. This Coleman 8-Person Instant Tent measures 14 x 10 ft. with the 50D material. It has large screened windows and doors which provide a great view while still keep the bugs out. You can feel comfortable and safe when using this tent due to its exclusive WeatherTec system with thick waterproof walls and welded floor. 4.4 out of 5 stars and over 1300 reviews is such an amazing figure. A four-season tent can be used in any weather conditions. It can withstand substantial snow loads or fierce winds of the winter. This tent is equipped with more poles and better fabric. EZ Up or Pop Up Tents are a great option if you don’t want the hassle and headache of having to figure out how to put up a more complicated tent that is in many pieces. Pop up tents offer quick setup and takedown, so you can be well on your way to enjoying your trip, rather than facing the frustration of wrestling with the tent and figuring out where the various tent poles belong. Screened tents are ideal for those outdoor adventures and ensure you can keep your view of nature but have the added mesh protection from the creepy crawlers that may be lingering outside. Beach tents and shelters offer much-needed shade while at the beach and are great if you are planning on some beach camping or glamping. They are made to withstand the sun’s harmful rays, less than ideal weather conditions, and can stand up to a strong ocean breeze and high winds. Choosing a famous and reliable brand to spend your money may be a smart choice in many cases. There are a number of well-known brands for your consideration, such as Coleman, Big Agnes, Wenzel, Ozark Trail, Mountain Trails. Coleman, let’s say, they cover around 70 – 80% of the US outdoor market, especially camping tents. For many people, taking a good camping tent from favorite brand or company will make them more confident. Coleman is a quite famous brand with camping tents and other relating products. As it said, “Coleman tents were built for the outdoors. A tent from Coleman provides the durable construction, protective features and solid architecture that you depend on for safe, enjoyable accommodations for your camping tent. Let the superior reputation of Coleman tents ensure that you have your best trips yet.” You will definitely satisfy with a large range of selection from Coleman. Depending on different shapes of the tents, you will have various types: Dome, Stand-up, Instant, Pop-up, Large tent. In big events or activities, a large tent, usually more than 10 persons, is the best choice for you. Purpose: Family or school reunion. This tent is very roomy. It’s absolutely the best of cheap big tents. It measures 17 x 9 ft. and fits 10 people or 3 queen airbeds. 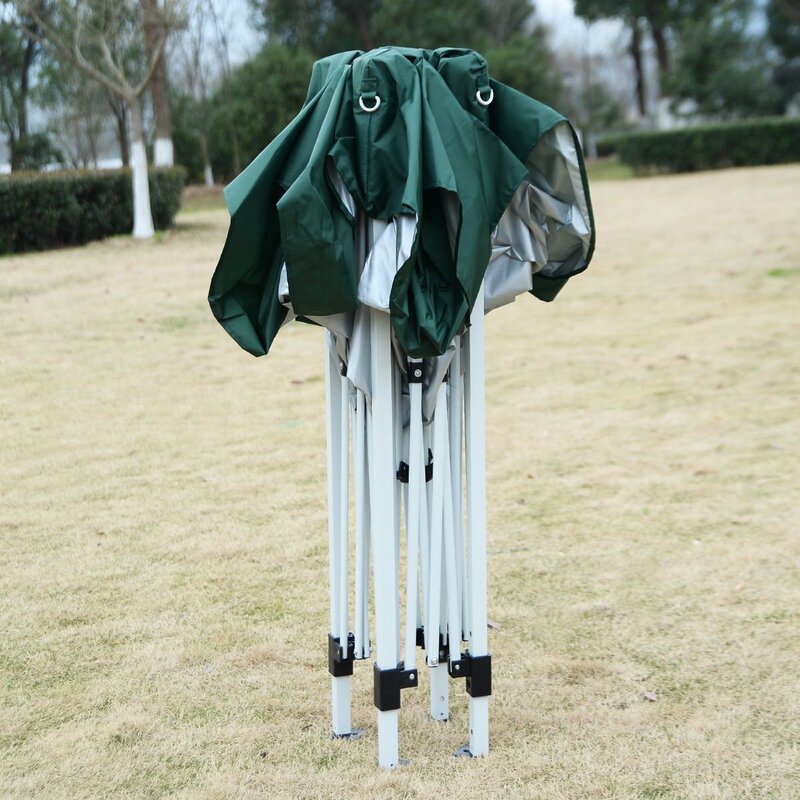 The center height is around 6 ft. 8 which enables you to stand and move easily. You can completely feel comfortable when staying in this tent due to its durable TC fabric construction and Waterproof WeatherTec system. Standing Room 100 Family Cabin Camping Tent With 8.5 feet of Head Room, 2 Big Screen Doors (4 Big Screen Doors with Grey XL), All Season Weather Proof Fabric, Fast & Easy Set Up. 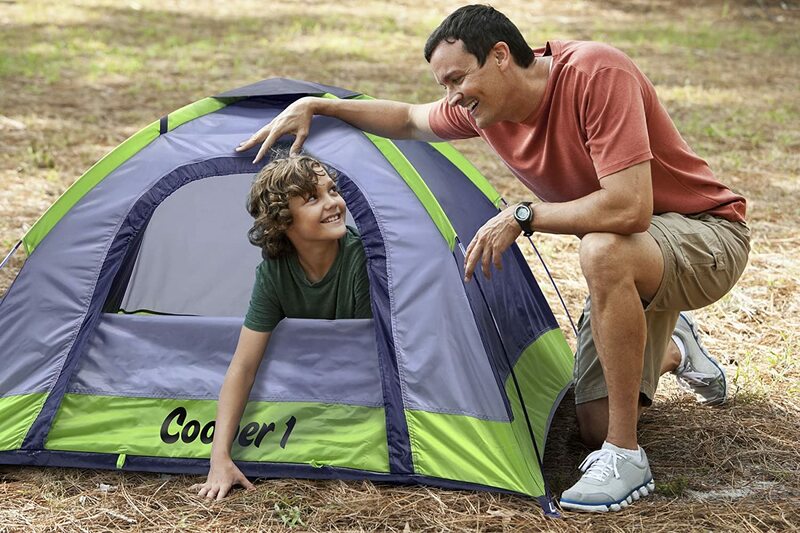 This Coleman Pop-Up Tent for 4 Person offers enough room to sleep for two adults. It is ideal for weekend get-aways and festivals with the package size is 34.8 x 1.8 x 34.8 inches and weight is 7.1 pounds. Dome Tents are an option that works for family camping as well and may even provide a bit more space and headroom, so you are more comfortable on your next camping trip. It can also go a long way in keeping you warmer on those cooler nights or dry during rainy weather conditions. Cabin Tents often are the biggest option and include separate sleeping and eating quarters that are typically divided. You can have all the room you need to sleep comfortably, while also having a covered area to eat meals, hang out, or keep your gear, so it stays dry and safe. Room dividers are a great option to have for larger families. Choosing a good tent that is reliable and high-quality at a cheap and affordable price point is not an easy task to undertake. It takes some serious consideration, time, and research to find what will work best for you and your family. What kind of features do you want the tent to have? When you choose to buy a tent in the store, rather than online, you are awarded the advantageous opportunity of being able to test the tent, see how large it really is, and have a little more hands-on experience with it prior to purchasing it. You will also be able to see just how difficult or time-consuming the setup process can be. When you purchase a tent online, on the other hand, you can find many websites that offer more than competitive pricing, so if it is a cheap tent option you are looking for, you may have more luck when shopping around at different sites online. You will even have access to several reviews of each tent option so that you can have a better idea of other user’s personal experiences with the tents. Amazon is always a great place to start your search for the best cheap family tent for camping because you will be able to find a cheaper price, read reviews, and see how high the tent is ranked and rated. Access authority outdoor blogs like: Backpacker, Adventure Parents, … and this website. One of the top online websites is Amazon.com – a reliable online place for purchasing and making best decisions (by considering all Amazon customers’ reviews and rating points). Using Amazon to search for a cheap tent is easy. Simply type in what it is you are looking for and wait for the results to appear. There is even an option to refine the search, so you can narrow down the results to something a bit more manageable and more focused on what you are looking to purchase. Some popular criteria to look for include average customer reviews (look for products with four+ stars), price, and condition (new or used). When looking through reviews, make sure you look at all of them; good and bad. You can also look for the answers to any questions you may still have regarding the products you are interested in. This website that you are reading this information on is another reliable source because we are a participant in the Amazon Services LLC Associates Program, an affiliate advertising program that has been designed to provide a means for the sites to earn advertising fees by advertising and linking to Amazon.com. With Amazon, you can find the biggest name brands, some of the best prices, and a large selection, so you are sure to walk away with the satisfaction of knowing you have purchased the best cheap family size tents for the money and you are ready to begin planning your next trip. We open the comment section today to welcome any questions and sharing.